I’ve been quite busy in the past week or so acquiring a flat, and moving in. I live in a suburb called Bandra West now, which lies north of Mahim Creek and west of the railway line, beside the sea. I’ve been riding on the suburban trains, and doing a bit more wandering around and exploring. The trains are exhilarating. The city itself is exhilarating. Wandering back from Bandra station in the evening, past all the stalls selling phones, plywood, fruits and vegetables, jeans, shoes, wallets, compasses, lined along the road. The road is thick with pedestrians, and a steady stream of black and yellow auto-rickshaws. I pass a corner wreathed with bright pink lights, standing out mesmerising in the darkness, and there are vertical golden lights strung all the way up the high trunk of a palm tree. I walked to the seafront at Carter Road one warm evening, along the promenade. There were palm trees behind me, rustling with the sea breeze. When I looked out to sea, there were boats in the darkness, and people moving out there on the distant rocks – shadow forms lit from above by the brightest sliver of moon. A few stars hung overhead, and lights from planes making their blind way through the night. The air was warm, and a dog was curled in front of me, asleep on the cooling sand. It was then that I began to fall in love with India. I’ve visited a cathedral in Fort, and a few new bookshops, cafes and parks in Bandra. I love to walk about and travel around in the evenings, when there are so many colourful lights and the bright moon, and always the sea surrounding the city, with its unseen waves crashing in the darkness. To get to the south of the city from my flat, you can walk or take an auto-rickshaw to Bandra station, pay 20 rupees return for a second class ticket (25p; a First class return is 100 rupees – about £1.20) to Churchgate on the Western Railway. Outside the station are lots of stalls, selling virtually everything. There is a large mosque next to the station, and on the far side of the platforms the slum Dharavi begins, beside the rail lines. The trains are really well organised: as well as First and Second class carriages, there are separate compartments for women only, elderly/disabled/cancer patients, and a luggage hold. I was standing on the platform waiting for a train to Churchgate, and a train that was not stopping at Bandra came past. Up until then I had been thinking about how the platform is similar to the one at New Cross Gate (in Lewisham, London), but this made it very different. At New Cross Gate, there are several announcements warning that ‘The next train at platform (6) will not stop at this station, please stand back.’ And a train travelling slower than normal speed passes through. While I was standing at Bandra, there was no announcement, the train appeared, and blared past at full speed. There was no need to tell anyone to stand back, since the force of the rush of air from the train actually pushed people back. In fact only a couple of people were stupid enough to be standing nearer than a metre to the edge anyway and not have realised this – I was one of them! Taking the trains is an adventure, because the sides of the trains are open. You can lean from the doors while riding, and jump off onto the platform before the train has stopped. People also jump on board before it has stopped, so it can get quite challenging to avoid collisions. 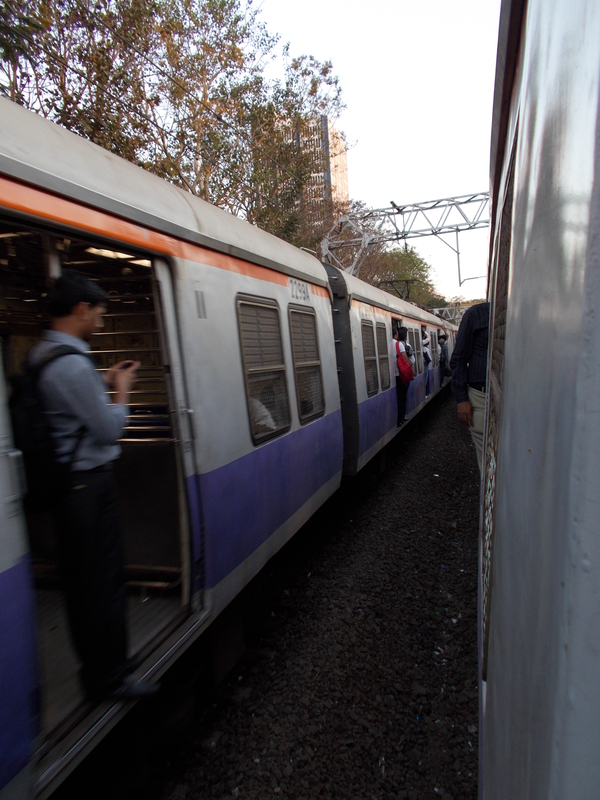 The suburban rail network in Mumbai is the busiest in the world, and at peak time there can be 16 people per square metre. I read this in the Rough Guide, and wondered how it could be physically possible, but people make use of every space, and hang out the doors. Pressed inside at one of these times, as you step up onto the train you immediately get kind of sucked into a space like a vacuum, and then held up by the bodies around you. All you can see when compressed in the middle of the train, are the other men’s arms, holding onto the metal rings above and everyone swaying with the motion of the train. Something rather unpleasant that happens at crowded times, I’ve found, is that – because of the onslaught of oncoming passengers boarding before the train pulls in to a platform, and the number of people trying to get on and off within a few seconds – some of the men standing nearest the doors take it upon themselves to ‘assist’ people disembarking and embarking, taking hold of one’s backpack and throwing you out onto the platform, or – if you are not wearing a backpack, simply pushing you from behind. This is rather disconcerting to be launched before you’re ready to go! The men getting on then get pulled up and helped on, in return. There is no malice in any of it; it’s simply a system of managing the body of people as a whole. When it is emptier, you can stand where you like, and lean out off the edge by the doors, and watch the world flash by. Riding the trains in the darkness is really beautiful. The bright lights gleam off the rails, and the warm night air rushes in through the train’s open sides. Sometimes the wind is so fierce you can hardly breathe while leaning out the door. When another train passes alongside, it is an accompanying phantom of glowing lights in the darkness, stirring up the wind. The road from the station has the palm tree on the corner, where all the pink lights are. The palm leans precariously over the road, and its jaunty lean is somehow emphasised by the lighting up its trunk! 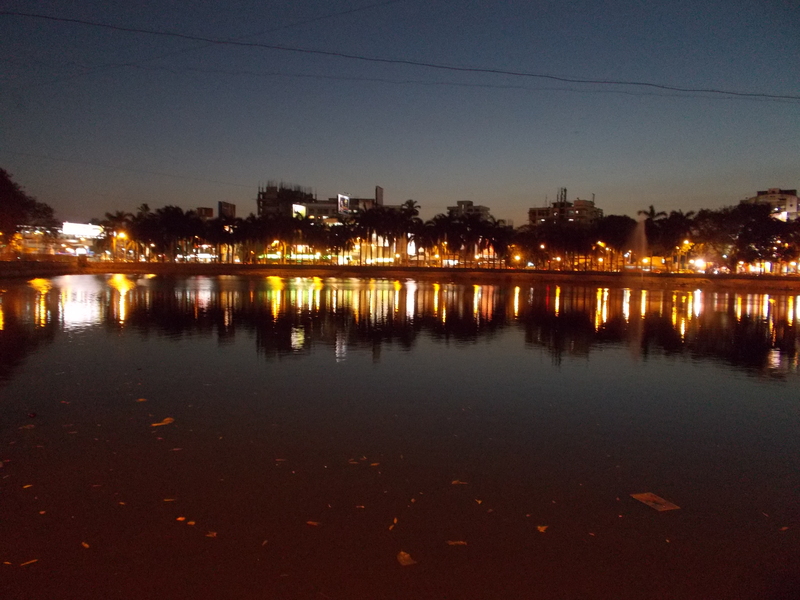 There is a lake alongside that street too, and in the night it glows with gold and green lights reflected in its surface. Welcome to my city! Our city, rather, since you seem to have fallen in love with it too. Bandra west is a lovely place. If you are a foodie, keep an eye out for the small cosy food treasures. Suzette, for one…the bagel shop…and the not so small Candies. That place looks like a regular rectangular building on the outside and completely different inside. Id recommend eating the chocolava at any level above the room of lamps. Also, if you want a taste of Indo-chinese food, go to global village. Its on carter road. Take the right after costa coffee… not the immediate right, but the one after it. You’ll see a mechanic just at the corner. And a small kitchen next to it with a menu board that says ‘idli, samosa, chinese’ or something like that. Ask for the triple schezwan followed with chai. Dont worry about the hygiene, though. It delivers orders to a few expensive eat outs on carter road itself. Dont pay more than 200 for it! Thank you very much for those recommendations! I’ll be sure to try those places and meals, they sound excellent! Anytime! Hope you enjoy them! Again, have a nice stay in Mumbai! Thank you, and thank you for commenting! I will let you know when I try them. I’m still getting the content of the site set up at the moment but it should all be organised soon!